Alex Montenegro (second from left) was selected as the 2018 Volunteer of the Year by the Texas Festivals and Events Association. Also pictured: Daryl Smith, Texas Onion Fest Committee Chair; Laura Espinoza, Weslaco Chamber Marketing Director and Doug Croft, Weslaco Chamber President/CEO. 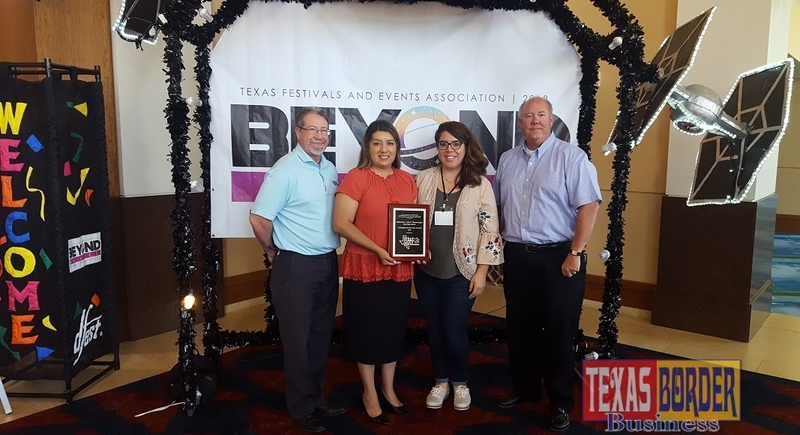 Texas Onion Fest volunteer Alex Montenegro was awarded the 2018 Volunteer of the Year Award at the Texas Festivals and Events Association (TFEA) annual conference held at the McAllen Convention Center in July. Alex was recognized for her dedication to volunteering as the Finance Sub-Committee Chair for Texas Onion Fest, which is held every March at Mayor Pablo G. Pena City Park in Weslaco. As head of the finance committee, Alex is in charge of creating the volunteer schedule for various festival areas – ticket sales, drink distribution and the banking center. Once she has set the schedule in place, she then reaches out to not only her own bank, but local banks in the area to recruit volunteers who are experienced in money handling. In total, Alex manages 30-45 volunteers. Alex was invited to the TFEA awards luncheon in McAllen, unaware that she was one of the honorees. Unbeknownst to Alex, her family and four of her Frost Bank co-workers were also present. Weslaco Chamber marketing director Laura Espinoza recognizes the value of a self-sufficient volunteer and knew Alex deserved to be recognized at this statewide event. TFEA represents hundreds of festivals that celebrate the history, legends, culture, art, folklore and natural beauty of the Lone Star State. The Texas Festivals and Events Association (TFEA), an official affiliate of the International Festivals & Events Association (IFEA), is a professional trade association for Texas-based festival and event planners, volunteers, and suppliers. For more information on Texas Onion Fest, visit Weslaco.com/onionfest.